When it comes to commencement, nothing can make a student feel more proud than being recognized for their achievements. 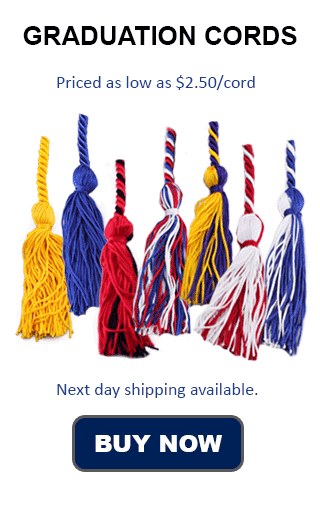 Graduation cords can make your graduate stand out among the crowd. For those students who have been members of a sorority, or who have been involved in women's studies and related fields, a double cord in red and green is the perfect token of success and honor. Red and green double honor cords represent dedication to the improvement of understanding women's rights in a society that is generally male-dominated. These students deserve to be rewarded for their efforts, and encouraged in their endeavors to change the world. Our Red, and green Graduation Honor Cords are all 70 inches in length and are made from quality dyes and materials. We do our best to get all orders out the same day, and offer a wide variety of shipping options, including our flat $4 shipping to anywhere in the US in 4-6 days guaranteed. That is no matter what size your order is. We also offer bulk shipping discounts, so you can order for your whole sorority and save. Alpha Chi Omega is a women's fraternity (sorority) whose colors are green and red. They have two philanthropic institutions that they support: Alpha Chi Omega Foundation, and Domestic Violence Awareness. Though they don't offer honor cords through the sorority website, students who have been members of a sorority can still be honored for their achievement. Red and green honor cords make excellent gifts, especially for those students who have been dedicated to similar charitable institutions or societies. Order your Green and Red double cords from Honors Graduation today, and show your graduate how proud you are of how far they have come.